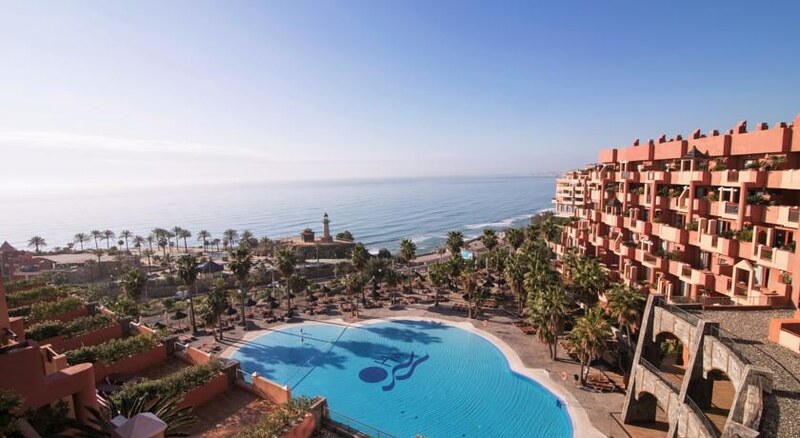 Holiday Polynesia is a 4-star, all-inclusive hotel in Benalmadena, Costa del Sol that ensures a relaxing beach holiday in the Spanish Costas. Boasting a beachfront location and equipped with modern amenities, this hotel features an atmosphere that recreates the Polynesian islands of Bora Bora, Samoa and Easter. 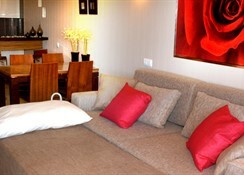 The lavishly furnished suites are equipped with private balconies and fabulous sea views. Gaze out on the azure Mediterranean Sea from the comfort of your room or rejuvenate yourself at the Jacuzzi on the terrace – the hotel offers guests amazing hospitality in the lap of nature. Perfect for families and couples, the hotel offers gourmet cuisine, excellent spa treatments, a beach club with Jacuzzi swimming pool, a wave pool, a bowling alley and endless entertainment for kids and adults during the day and at night. While adults lounge on Balinese beds by the pool, children can let off steam at the kids’ area, which has a mini-golf course and a pool. 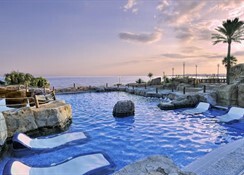 Holiday Polynesia is located right on the Benalmadena coastline in Costa del Sol with great views of the Mediterranean. 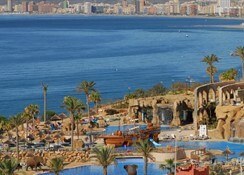 The resorts of Benalmadena and Fuengirola are a short distance away. The hotel lies about 21 km from Malaga Airport. There are three different themed blocks at the hotel, each modelled on different Polynesian islands: Bora Bora, Samoa and Easter Island. The rooms come in categories of Junior Suite Sea View, Suite Sea View and Frontal Sea View Junior Suite. They are opulently furnished with en-suite bathrooms with separate bathtub (in larger suites) and shower, hair dryer, kitchenette, mini refrigerator with small freezer, air conditioning/heating, living room, telephone, Satellite TV, safe, desk, music system and private terrace with furniture. The sea view suites have Jacuzzi on the terrace. The hotel has a buffet restaurant Maeva that offers an elegant dining experience amid leafy tropical forest. Indulge in traditional Polynesian flavours at Ahima’a Polynesian Restaurant. Uru Wok Oriental is the place to go for Asian cuisine. Maitai Piano Bar, Tatau Snack Bar and Tiki Snack Bar can provide you Polynesian cocktails and delicious light bites at the pool or lounge. The hotel also offers the option of in-room dining. Holiday Polynesia tries best to keep its guests entertained and provides an array of relaxation and recreation opportunities. It offers a beach club with Jacuzzi swimming pool, a large outdoor swimming pool, a wave pool and an indoor pool at the spa. The Monoi spa offers the perfect relaxation with a full spa circuit, which includes contrast showers, Finnish sauna and Turkish bath. There are games room, recreational zone, night club, cinema room, outdoor auditorium, bowling alley (with three lanes). The kids’ area has a themed mini-golf course and a swimming pool. Entertainment for kids and adults are regularly hosted during the evenings. For business travellers, the hotel offers multi-purpose rooms, exhibition areas, business centre and Wi-Fi. We loved the hotel however it wasn`t mentioned that in Feb ,March none of the restaurants were open ,nor was the pool, the only thing to do in the complex was the Spa or kids games. I`m sure in holiday season it would be fantastic as there is a large pool complex which was however also closed but the hotel is beautiful.Out of season it is handy as a base only. It has a small shop but of no real use for self caterers.There are bus stops on the main road which for around 3 euros take you to Fuengerola or Benalmadena both of which have plenty of supermarkets, the former being much better. As long as you are happy to get out and about its all good. The rooms were well appointed , the only possible addition for self catering would be an oven. There is a microwave and a hob which is fine for the summer but not really off season. If you use your head, there are two other hotels in the complex one of which had two restaurants and a bar that were open. The staff were really helpful, the rooms and balcony spacious and clean, the bed however wasn`t for the fainthearted, unless you have a medical condition that requires you to sleep on a board. The only bar, coffee sitting area open was beside the pool which felt more like an airport lounge, somewhat devoid of personality which was surprising for a 5 star hotel. For a short break off season it does the job as long as you understand that it is really only a small apartment base so as you would at home you have to make an effort to do the shopping and to go places. Nice location.